With 260 pieces, the retail price of 29,99 € equates to a price of 0,12 € a piece. 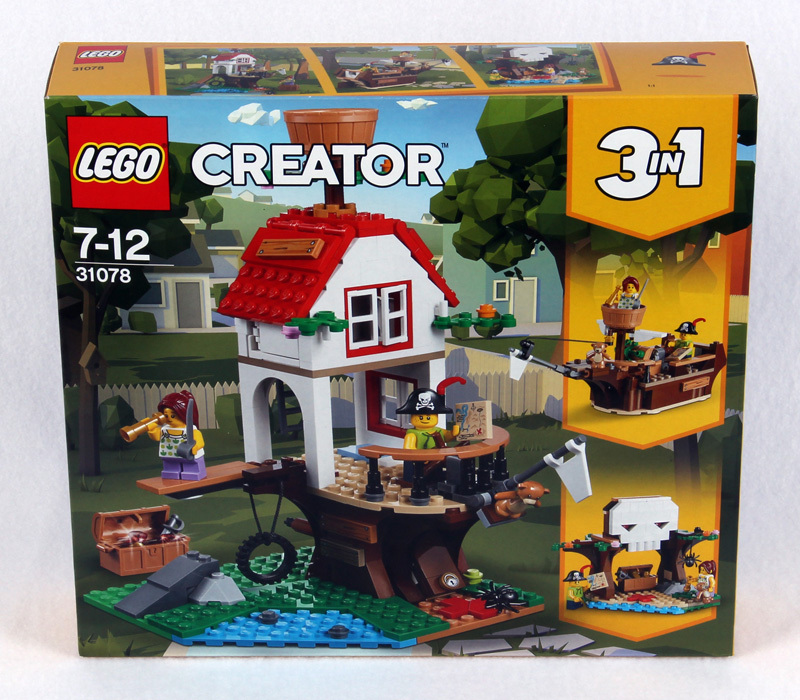 This is in the higher range for 2018 creator sets. In comparison, set number 31072 Extreme Engines comes down to 0,09 € per piece. And the 31074 Rocket Car is even down to 0,08 €. Well, I'm not sure the parts of latter set will be of versatile use with those strange colours... 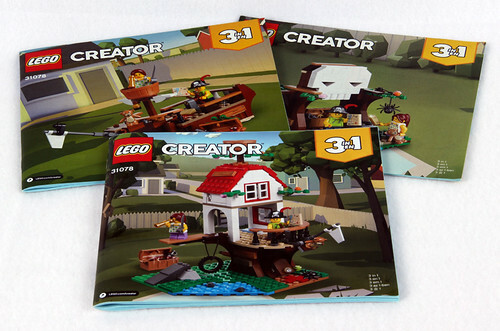 Funny enough, all 3 sets have been designed by the same person: Jeremy Luettgen. He has also been active designing some of the Mixels. Anyway, given the basic and tuned down colours of this set I think it's worth buying it for the retail price. 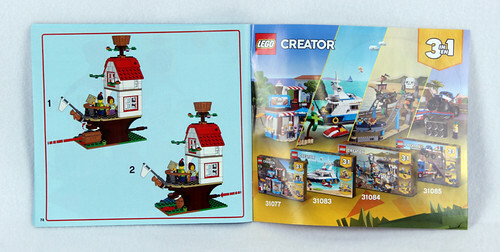 The back shows the play features for each of the 3 sets and a link to the LEGO Creator homepage. You can also see the tabs to press in when opening the sets. I have to say that I am impressed by the simple look of the packaging. Nothing too distracting, nothing much to shift your attention away from those wonderful builds. 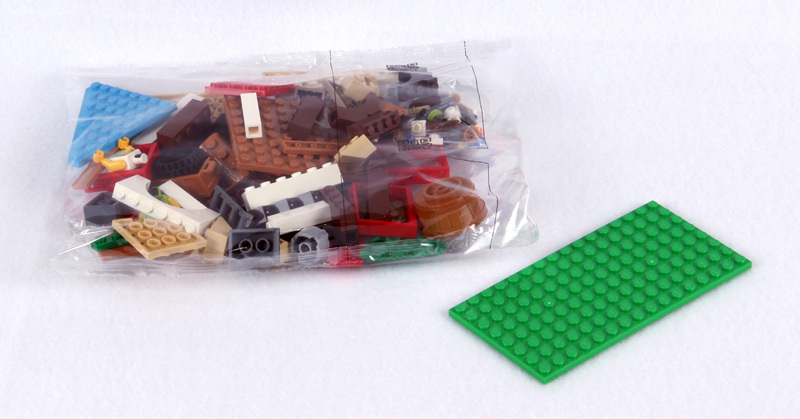 After prying open the side, we have 3 bags with pieces, 1 Green plate 8x16 and 3 instruction booklets in our sweaty hands (or, hand and hook if your name is Captain Red Beard). 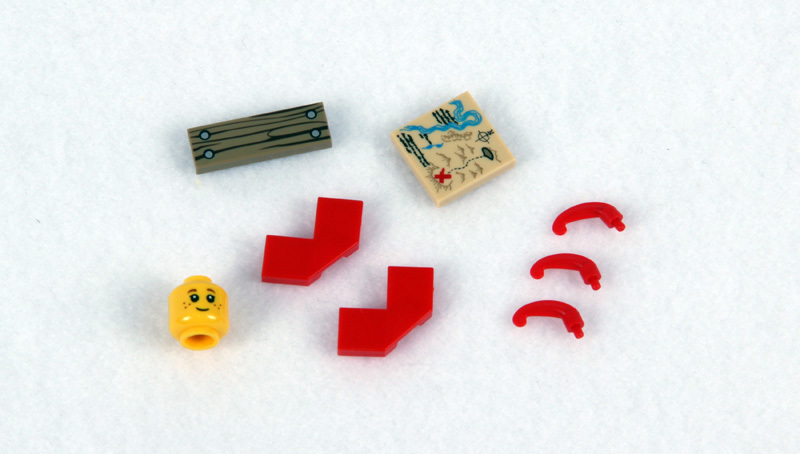 We will get to the instructions later, so let's take a look at the pieces now. 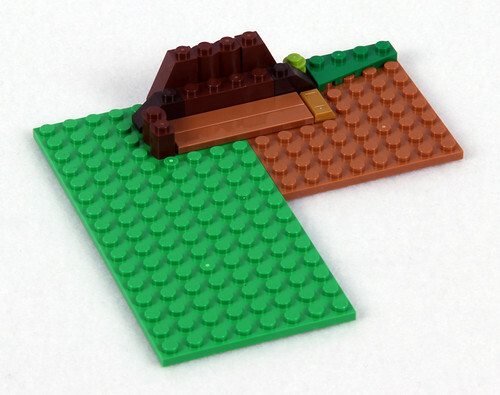 The Arch Bricks 1x5x4 in Dark Brown are nice parts for castle or ship builders. The Wedge Plate, 8x8, Cut Corner in Dark Azure is unique to this set. The Round Corner Tiles, 4x4 (called Maccaronis as I understand) in Medium Dark Flesh are also unique to this set. The wood planks are prints, overall there are NO stickers in this set. The decors are all printed. The short wood plank (1x3) together with the longer ones pictured here (1x4) can also be found in 21310 Old Fishing Store. 2x3 Tiles are quite new to me, while in fact they have first appeared in 2016. There's also a treasure chest in Medium Flesh in this set, which adds to the play possibilities. However, I do have a bit of a problem with it: You can close the lid, but as there is no resistance while closing it opens on it's own if you turn it upside down. Having some old-time sets around here and also a chest in brown (from the 80ies or 90ies? ), I was wondering if they had the same problem? Well, nope. They do have a bit of a resistance while closing, maybe related to that pin on the lid, and they definitely do not open themselves without assistance. 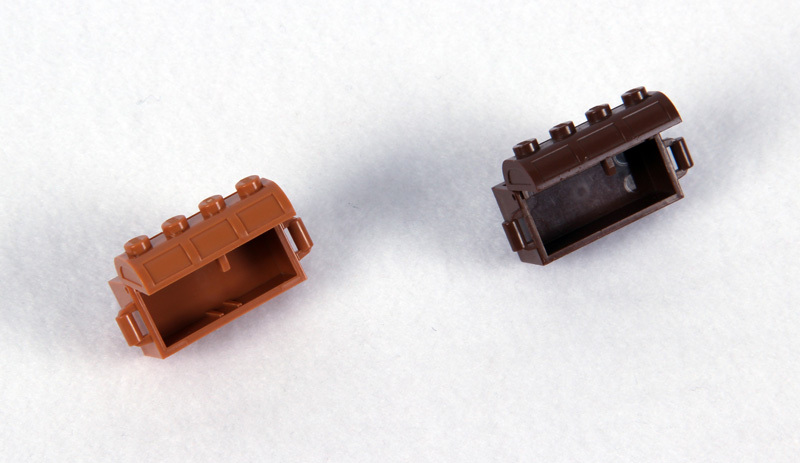 Seems LEGO employed some mold change, as the older ones are also missing those 2 ridges at the inside front. 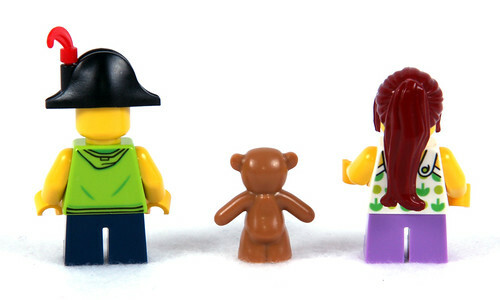 This set features 2 minifigures, a boy and a girl. 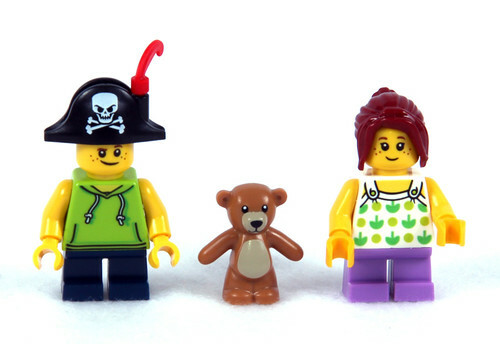 Both minifigs have a single sided head, yellow arms, short legs (non-posable) and torso prints on front and back. The boy has a lime hoodie, while the girl features a white shirt with green print. It also includes one of these nice little teddybears with a torsoprint. 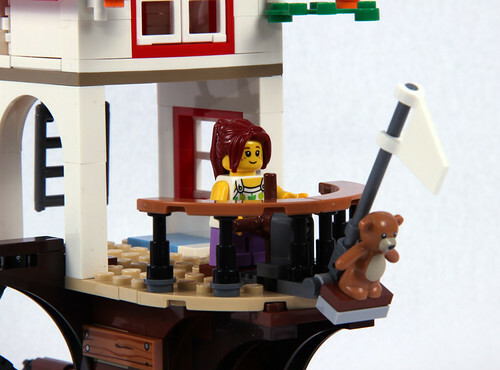 While both minifigs are unique to this set, both torsos have seen use in other sets too - the boy's torso in 10260 Downtown Diner, the girl's one in 10261 Roller Coaster. As accessories, there is a pirate hat with a feather. 2 spare feathers are also included, which is a nice treat as those small parts have an affinity to getting lost. 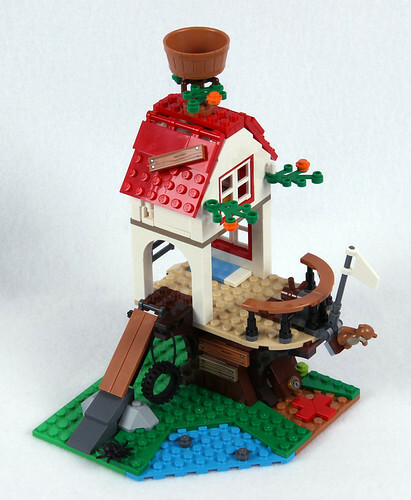 The plume feathers are not on a sprue, as LEGO has done in the past with Pirates or Castle sets in the 90ies, but come loose in the bag. 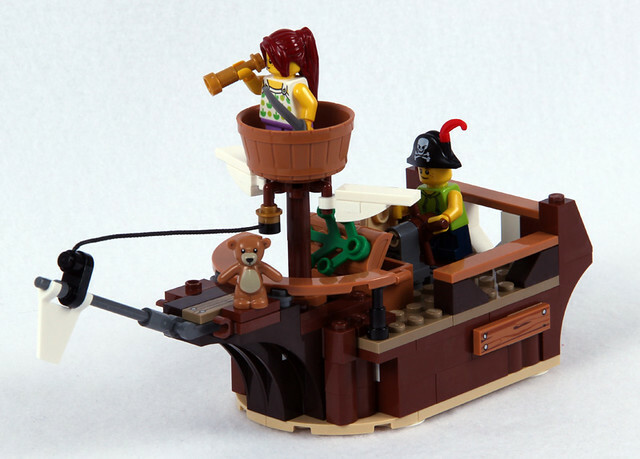 However, there is no "normal" hair piece included for the boy, if you decide to make your place somewhat less pirat-ey. 2 pirate swords are present along with a golden telescope and a printed 2x2 tile with a treasure map pattern to complete the play experience. Overall, the instructions are nice and clear to follow. No printing errors or other mishaps. Instructions of the main model start with building the minifigures and continue with a somewhat ridiculous Step 1... 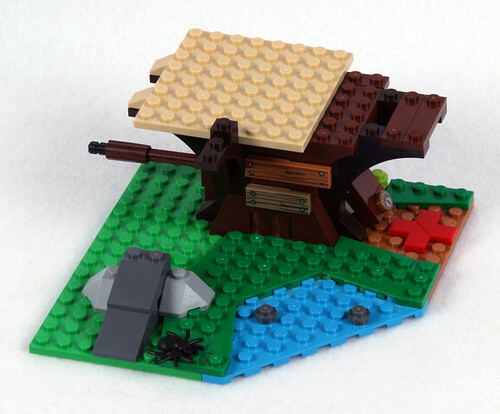 When you are finished with building model A, the play feature is explained on the left side. 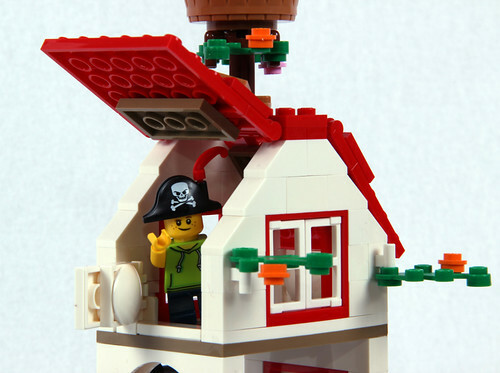 On the right we have some more models available from the 3-in-1 series as house advertising (Avast ye bastards, look at that Pirate Coaster set ... ahem... Excuse me for getting a wee bit distracted here....). The parts list is in the back of model B. What amazed me is the stability of the construction. I had the opportunity to build set 31080 Modular Winter Vacation and that thing just disassembled itself after 5 minutes of play time. 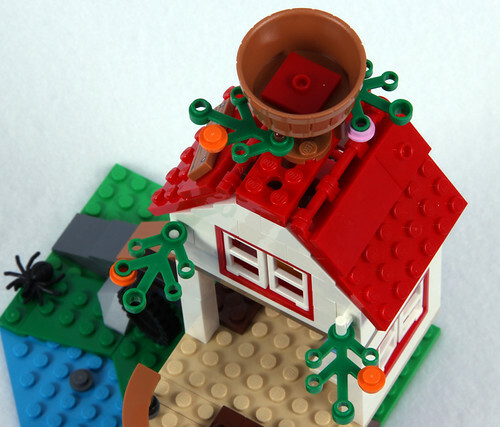 In stark contrast, the Treehouse is rock solid and will surely be better suited for heavy play. Nice little details here and there, like the little rocks in the water and the spider waiting to catch those nasty little ki... err, let's just say it is waiting for prey. Play feature No. 1 definitely is the hidden treasure cache in the tree trunk. There is a little flap with a lock on it, which can be raised manually. 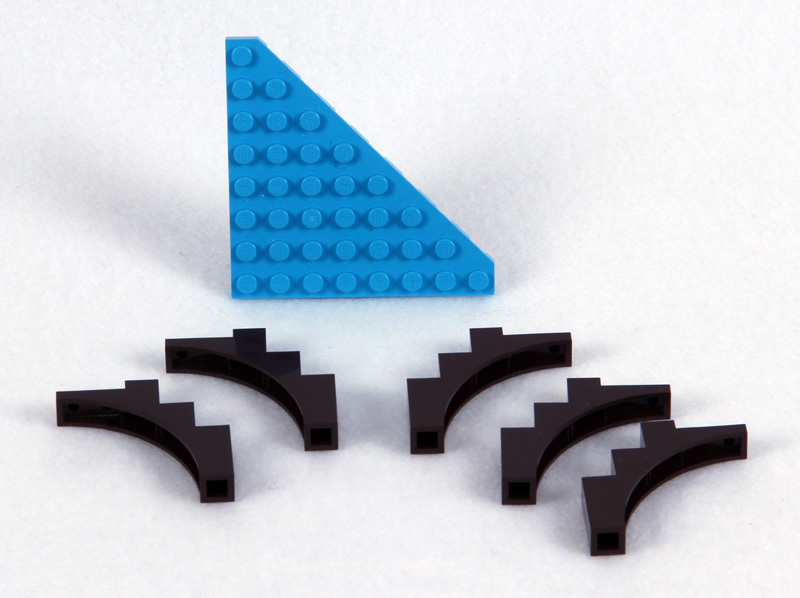 The flap itselfs sits on a bar which is held in place by 2 blue technic pins. Behind that flap is space to hide the treasure chest. This chest can be ejected with the help of technic axles and axle connectors at the other side of the trunk. 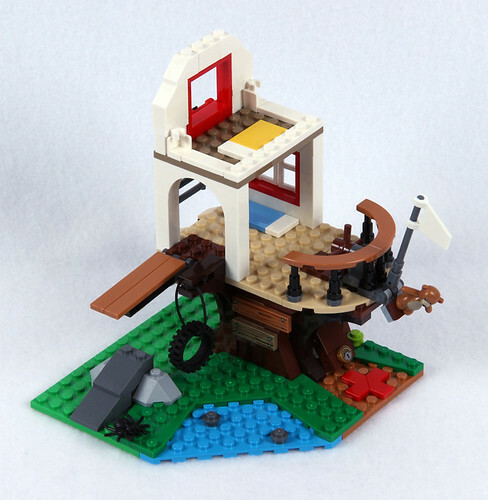 Other play functions are the openable top room (sides and rooftop) with crows nest atop, the tire swing and the ships bow with the steering wheel. 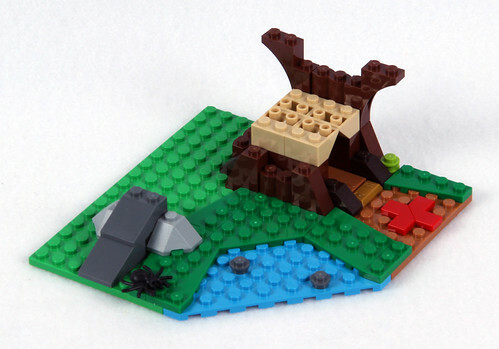 Not to forget the slide at the side of the treehouse, which can be raised to be used as a plank. A lot of parts are left unused, which could have been integrated easily. Therefore it's a pretty straightforward build experience and the B model is thus lacking a bit in play value. There is the crows nest and the lower deck with the spider in it. A posable rudder is present at the back and the steering wheel is now in the right place. 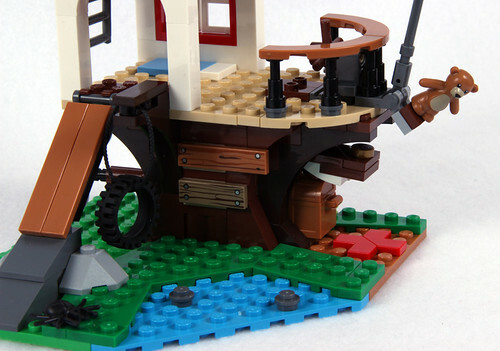 I wonder why the treasure chest is placed on the deck, it may better be kept below deck. 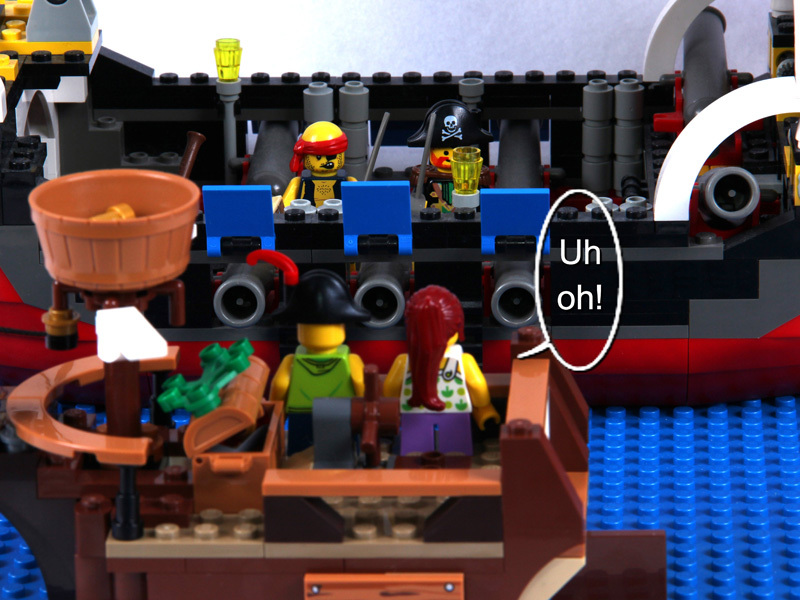 Oh well, as luck would have it our unexperienced seamen have a rather unpleasent encounter at sea. Seems someone else noticed that treasure chest too. Some useful armament wouldn't go amiss on this little bark. 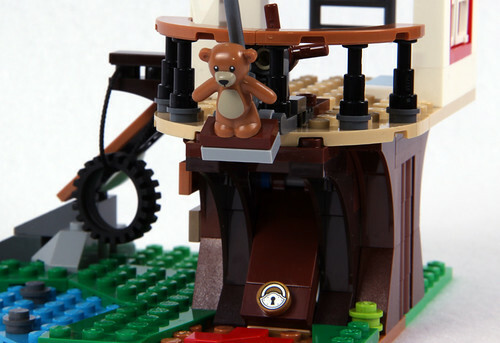 Maybe throw that teddybear over to soothe those angry pirates? + All prints, no stickers! I couldn't be bothered assembling the C model, it's just too plain and definitely not a cave at all. 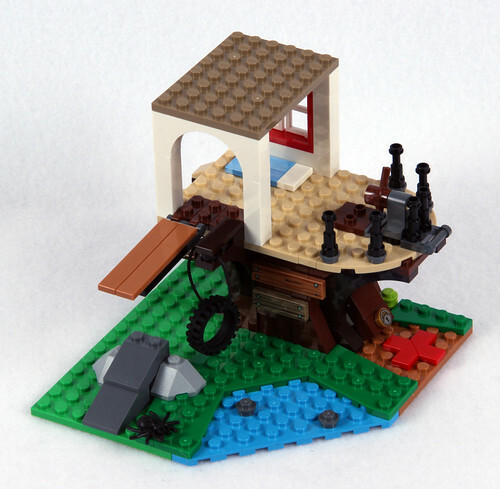 But the treehouse and ship have been great fun to build and play with. While this set overall may not be outstanding to me, I would definitely put it into the "Above Average" category. 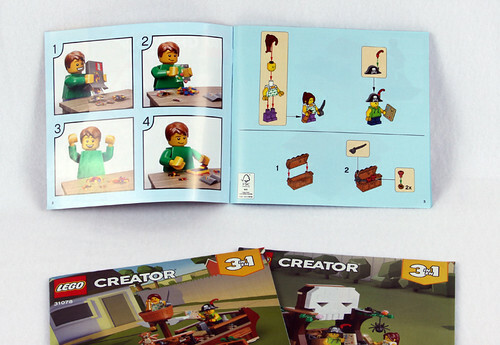 It's play features and overall value due to the parts and colours and the fact that there are 3 full blown instruction booklets makes it worth. I can repeat it over and over again: All prints, no stickers! I guess that's also the reason why the price per part ratio seems a bit unfavourable. All in all a very nice set. 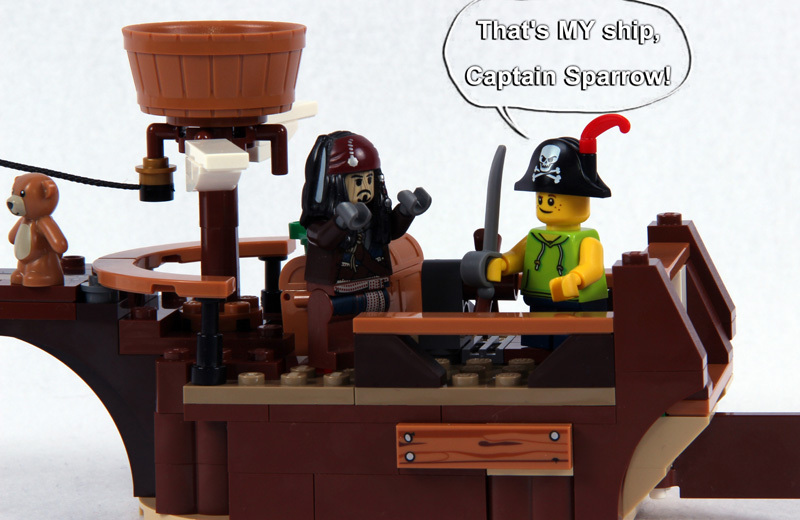 To err is human, but to arr is pirate!!! Thanks for the review. 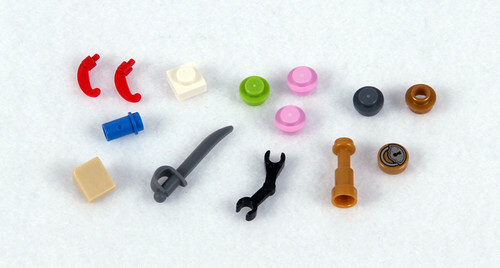 Any creator set is always filled with interesting parts and this is no exception. 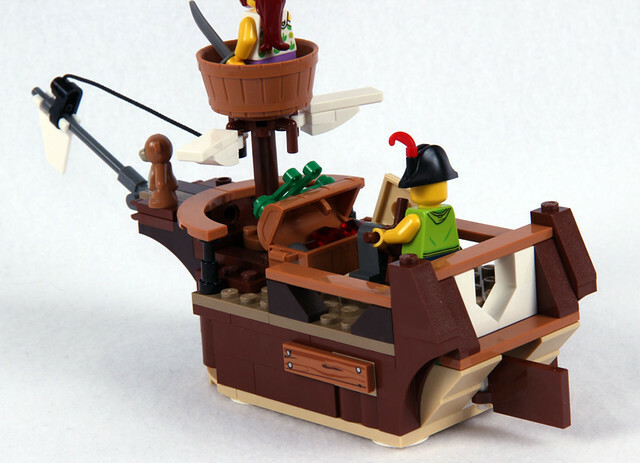 Inspiration from classic Pirates sets are definitely sprinkled on several LEGO Creator sets that came out as of late and this set is one of those sets that I will definitely put in my shopping cart once I see a decent discount.